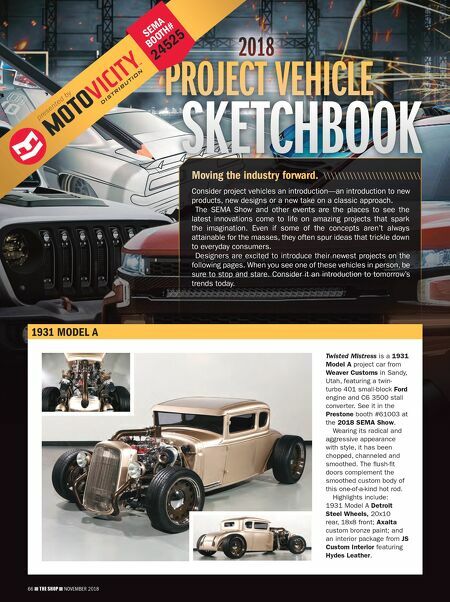 NOVEMBER 2018 THE SHOP 67 presented by SEMA BOOTH# 24525 2019 FORD MUSTANG Father-and-son designers Neil and Collin Tjin submitted competing proposals to Ford Motor Co. for a 2019 Mustang project vehicle. Collin's Widebody proposal won out over his dad's track-spec vision, and now he's working with Vaughn Gittin Jr. on an idealized drifter. The Mustang will feature Gittin's RTR products including: front fenders (50mm),·rear fenders (75mm), upper grille with LED triangle lights, lower grille, grille badging, front chin spoiler, rear diffuser, rocker splitters, rear quarter splitters, bumper inserts, hood extractor vents, wing, floor mats and shift knob. LTMW and Tjin Edition are pitching in as well. Participants include: Baer Brakes; Forgeline (wheels); Air Lift Co. (suspension); Michelin (tires); Full Race (turbo kit including: manifold, downpipe, front-mount intercooler, charge pipes); BorgWarner; Katzkin (interior); KICKER (audio); OPTIMA Battery; PPG; VIAIR (compressors) and Ford Performance (turbo, exhaust, strut brace). 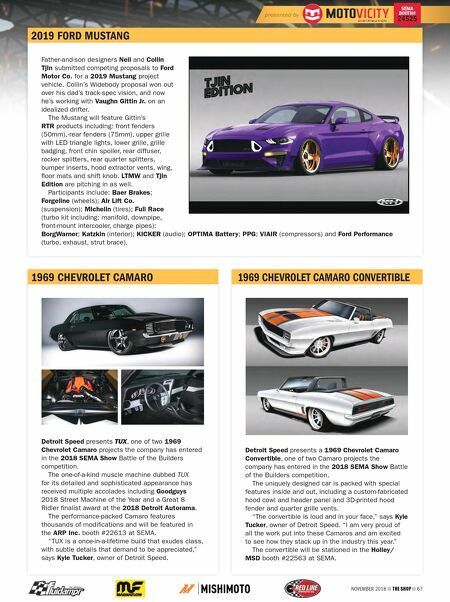 1969 CHEVROLET CAMARO Detroit Speed presents TUX, one of two 1969 Chevrolet Camaro projects the company has entered in the 2018 SEMA Show Battle of the Builders competition. The one-of-a-kind muscle machine dubbed TUX for its detailed and sophisticated appearance has received multiple accolades including Goodguys 2018 Street Machine of the Year and a Great 8 Ridler finalist award at the 2018 Detroit Autorama. The performance-packed Camaro features thousands of modifications and will be featured in the ARP Inc. booth #22613 at SEMA. "TUX is a once-in-a-lifetime build that exudes class, with subtle details that demand to be appreciated," says Kyle Tucker, owner of Detroit Speed. 1969 CHEVROLET CAMARO CONVERTIBLE Detroit Speed presents a 1969 Chevrolet Camaro Convertible, one of two Camaro projects the company has entered in the 2018 SEMA Show Battle of the Builders competition. The uniquely designed car is packed with special features inside and out, including a custom-fabricated hood cowl and header panel and 3D-printed hood fender and quarter grille vents. "The convertible is loud and in your face," says Kyle Tucker, owner of Detroit Speed. "I am very proud of all the work put into these Camaros and am excited to see how they stack up in the industry this year." The convertible will be stationed in the Holley/ MSD booth #22563 at SEMA.